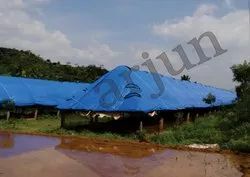 We are a leading Manufacturer of hdpe tarpaulins, poultry roof covers and poultry curtains from Salem, India. Features Pure Virgin Rawmaterials and UV Inhibited. 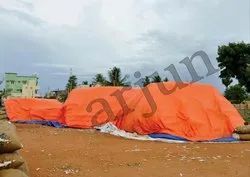 Our Arjun Armour HDPE Tarpaulins are Manufactured from Pure Virgin Rawmaterials and are UV stabilized.. and hence the life of the product is more than 4- 5 years. We have the Largest Manufacturing facility and the state of the Art Machineries . We have huge production Capacity to cater to any volume orders. Our Poultry Curtains are the Best in the Industry and they last for more than 4 - 5 years, as they are UV inhibited and are Made from pure virgin Rawmateials. Our Poultry cutains are avaialbe in Yellow and in Natural white colours and also in other colours depending upon the customers choice. The life of the product is around 4 - 5 years and the best in India.